The Nintendo DS has been home to some of the weirdest, wackiest, and just plain fun games over its nearly two-year lifespan, and part of its appeal has been the potential behind its touch screen-based controls to create some truly creative gameplay experiences. It's no surprise, then, that some of Nintendo's most beloved series get revitalized on the Nintendo DS as developers seek to wed new experiences with familiar Nintendo staples. Star Fox is one of those series, a space shooter saga with an anthropomorphic cast that gets an element of strategy thrown in via the touch screen-enabled Star Fox: Command. Star Fox: Command is a game-genre hybrid, combining elements of turn-based strategy games with classic Star Fox spaceship shooting. 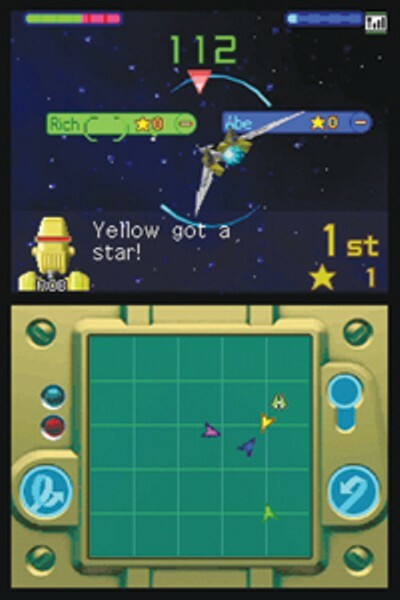 Players plan a route for their ships on an overhead map with the touch screen, where the goal is to intercept bad guys and collect powerups to help complete objectives. Intercept a bad guy on the overhead map and you go into Star Fox's shooter mode, where you pilot your ship in an effort to take down the enemies. However, using the touch screen to control your ship feels a bit loose and awkward, and it's easy to do one thing when you mean to do another, especially when trying to perform maneuvers like barrel rolls. Also, there are some elements to the strategic side of things --- such as intercepting cruise missiles --- that get a bit repetitive. Once you get past the awkward ship controls and other flaws, though, the game is a treat, featuring an engrossing single-player storyline with branching paths, a frantic multiplayer battle mode, and graphics and sound that really show off the DS's capabilities. Star Fox: Command is a Nintendo DS exclusive, and is rated E10 for Everyone ages 10 and up.